The Lutheran Church—Missouri Synod began work in Ivory Coast in 1991. In Dec. 2002, seven LCMS missionary families stationed in Ivory Coast were evacuated or not allowed to return following their home service due to the outbreak of civil war. The LCMS has not resumed the work in Ivory Coast with resident missionaries since the political environment remains unstable, but the Synod continues to make visits to encourage and equip the national church leaders and supports the church through leadership training. Over the years, the Lutheran church body grew to a baptized membership of more than 3,000 in 115 congregations and preaching stations and a national staff of 407 pastors, evangelists, teachers and lay preachers. The outbreak of civil war in the country in 2002 scattered many congregations, their members, and leaders. Before the unrest, the church operated a medical clinic, staffed with a doctor, five nurses and two medical aides. It also operated five primary schools and one secondary school. It had 95 Sunday schools with an enrollment of more than 2,500 students and had 40 Bible classes. 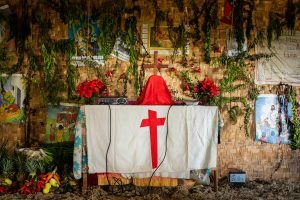 The Evangelical Lutheran Church–Ivory Coast Synod (ELA-SCI) currently has an estimated 1,500 members served by one pastor, two vicars and several evangelists in 32 parishes. The LCMS first supported projects in Ivory Coast in 1991. Grants enabled three missionary families to assess and supply short-term needs and plan long-term relief, development programs and evangelism work among Liberian refugees in the country. Such work included healthcare training, infant feeding and maternal nutrition training, agriculture and social ministry training, funds for indigent patients in crisis requiring medical care and building a clinic.